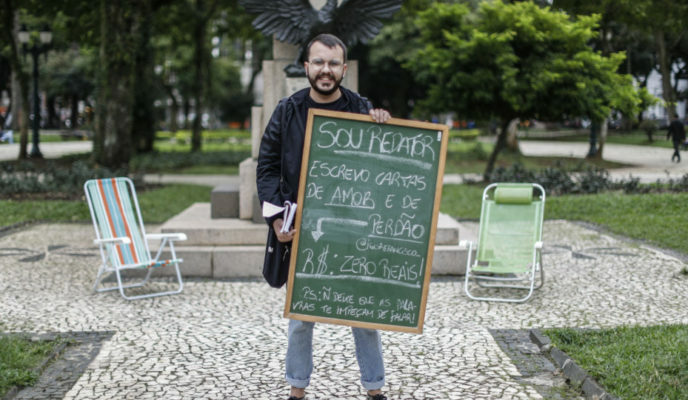 “Don’t let words prevent you from talking.” This is what 29-year-old ad man Igor Francisco, who walks along Santos Andrade Square, in the center of Curitiba. Next to a beach chair, an explanatory blackboard and a notebook, Francisco has been sitting on the square, next to Ruy Barbosa’s statue, since early April. His goal is to help people getting rid of their fear of putting ideas and feelings into words, starting by writing love or forgiveness letters – or both, if that is the case. To receive his help, those who are interested only need to sit down and tell him their stories. Around half an hour later, a draft of a letter is presented by him, and he then assumes a commitment of writing a more consolidated version in an email by the end of the day. The final letter, however, must always be sent by the person interviewed, who receives throughout the process tips on how to use the words used with more familiarity. All this is done for free. A writing teacher for three years, Francisco had the idea for the project when he realized how much people had difficulty in writing for a very specific reason: the fear of making mistakes. “People think that, in order to write “right”, they must use perfect words and impeccable grammar. That prevents them from beginning to write and practicing,” he explains. Therefore, in exchange for writing them their letters, he asks them answers for some questions, so he can perfect his own technique of teaching people how to write. Why do letters have to be love or forgiveness letters? Precisely because, in order to convey these feelings, the most appropriate words are the most genuine, he guarantees. Besides, the writer adds that his proposal has the intention of breaking the cycle of hatred many people have been experiencing on the internet. “We see so much fight in social networks, so many bad news… This ends up generating a ‘collective depression’, he regrets. Therefore, he chose to promote only good feelings. Even though his activity is reminiscent of the lead character in the Brazilian movie ‘Central do Brasil’ (“Central Station”), Francisco guarantees that he has had other inspirations for the model of his project. “I remember discovering on the internet a person who was willing to write a love letter for free, and I thought that that was something I was also able to do,” he explains. Since early April, the writer has held five sessions, in which he talked to six different people. The times he chose were always between the late morning and early afternoon, when many people are in their lunch breaks, or during the late afternoon, when many people have already left the workplace. His strategy is to look for the moments in which the square is filled with people, and that has been working out for him. Among the ideas generated by the experience, Francisco points out what he heard about love during this internet age: “He spoke to me about how the internet makes everything so fast, and people no longer get to know each other properly.” The advertising writer also listened to stories quite unusual, such as the series of disasters experienced by a couple on their first date. “He tried to open the champagne bottle, and the cork hit the roof and bounced back into the girl’s face. It seemed everything would go wrong, but, in the end, they ended up dating,” he says. So far, most stories people tell him to write down end up becoming love letters. However, they not always involve love affairs between couples. One of the most striking letters, for instance, was requested by an elderly gentleman, who wanted to show his affection to his grandchildren, who lived far away from him. Whatever the case or type of people interviewed by him, however, Francisco always realizes how much people trust him their stories, merely because they believe he dominates the art of writing. And it is precisely that which he tries to show that is not a strictly necessary factor when someone wants to write down their feelings, for instance. In order to add a more personal touch to the text, his trick is to be a good viewer. He needs, above all, to be watchful to the person’s voice tone, if he or she is more excited or calmer, if they are using slangs or a more traditional vocabulary, if they use humor or have a more serious tone, for instance. All these small details help him to make the text seem as if it was written by the person who is telling the story, even though the trigger to build the narrative came from Francisco himself. For him, as well as fulfilling his goal of understanding where people’s fear of writing come from, the experience has been gratifying for an unexpected reason: “I am able to see how talking to people of all kinds have helped me to leave my bubble, to get to know new ways of thinking.” Especially because, regardless of personal tastes, political choices, lifestyles or age groups, there is no one who is unable to tell something new to another person about love or forgiveness. And Francisco was able to realize that. Those who are interested in receiving Francisco’s guidance should look for him at Santos Andrade Square, always in front of the statue of Ruy Barbosa, the biggest one in the place, on top of an obelisk. Even though he has no fixed schedule for his writing sessions, he explains he will remain there throughout the month of April, always during lunch hours or on late afternoons. Further information can be found on his Instagram account, @igorfrancisco_ , where he often posts information about his experiences with the project.